This review must begin with a confession: I am a Potter-head; an old school one at that. Over the last 18 years I have revisited all 7 books and 8 films multiple times and spent many a car journey and restless night with Stephen Fry perfectly delivering each story from cassette (later CD) to my ears. I recall being about 10 years old and reading through Fantastic Beasts and Where to Find Them whilst wrapped in a soggy towel, sat in the swimming pool changing room as my hair dried into stubborn knots. Once the film series concluded I felt content. Since then, I’ve always been a tad sceptical about extensions of the universe, one that holds a special place in my imagination. I did not sign up to Pottermore and I was violently unimpressed with the fan fiction nonsense that crept into the pages of the stage play’s script. Hence, I’ve been wary of watching the latest film about the escapades of the author of a Hogwarts required textbook that I read, shivering next to the lockers, all those years ago. It’s 1927 and a mysterious beast appears to be wreaking havoc throughout New York City. Meanwhile, a British wizard with an overactive suitcase arrives in Manhattan, bringing with him a magical caper across the city with an astounded muggle and two ‘charming’ witches in tow. The wizard, Newt Scamander, brings with him a suitcase containing an abundance of magical creatures but none as threatening as the one violently assaulting the city and its residents. 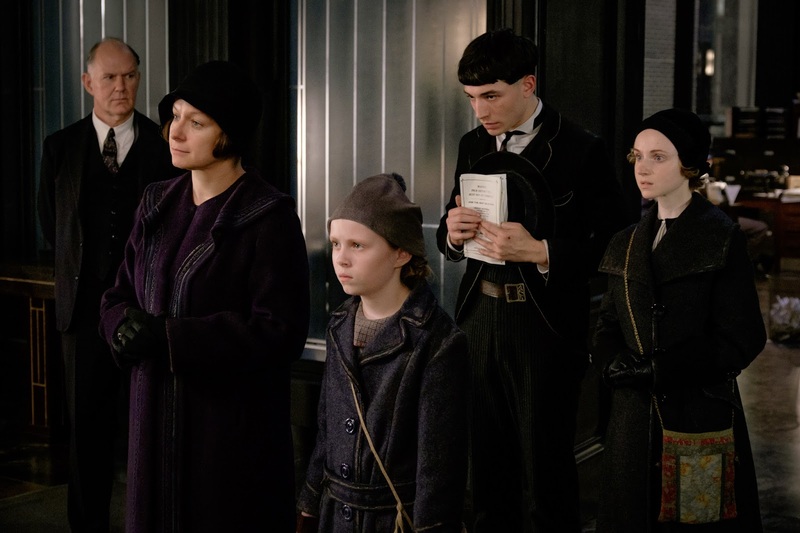 Fantastic Beasts and Where to Find Them loses its way in its second half but has enough whimsical small details to satisfy fans of the original series. In its finest moments, this is a smart, witty tale of a lone wolf on a mission to protect his beloved creatures. In its weakest, it’s Johnny Depp with a bad haircut. Katherine Waterston, Samantha Morton, Ezra Miller and the astounding Carmen Ejogo are all wonderful additions to the Potter-sphere despite Ejogo being terribly underused and Miller being dumped into an underdeveloped role. I would have loved to see Miller in Depp’s role – casting that would make much more sense. Colin Farrell is on decent form and Eddie Redmayne surprisingly won me over, despite concerning typecasting at this early stage in his career. Dan Fogler and Alison Sudol are the surprise delights of the picture; an adorable supporting duo of muggle and mind reading witch. Johnny Depp is unforgivable casting, a hideous addition to the cast in a role that he hams up to the max, in the fashion we’ve now come to expect from him. His portrayal of such an infamous character is baffling and ill judged. It seems Depp now thinks a change of contact lenses is a fitting substitute for giving an actual performance. He’s on screen for merely a minute but it was enough to infuriate. All in all, Fantastic Beasts and Where to Find Them is a well balanced but inconsistent addition to what’s gone before. It feels like a completely separate entity with just enough familiarity. Alas, the film’s score lacks the dazzling qualities of John William’s Harry Potter theme and it suffers from inconsistent CGI and an over-exaggerated final act. Somewhat over-stretched but all in all a bold and admirable attempt at breathing new life into a franchise – the question remains, do we really want to resuscitate? Tags: Adaptation, Cinema, Colin Farrell, david yates, Eddie Redmayne, ezra miller, fantastic beast and where to find them, film, Franchise, Harry Potter, Johnny Depp, katherine Waterston, Movie, Review, Samantha Morton. Bookmark the permalink.